Cry it out or co-sleep? Bassinet or swing? White noise machine or Bach? How many hours anyway? For something so important, there’s too much conflicting information about how best to get your baby to sleep through the night and nap successfully during the day. The Good Sleeper is a straightforward, no-nonsense answer to one of the biggest challenges new parents face when they welcome a brand new baby home. This book is written for exhausted parents, giving them immediate access to the information they need. Reassuring and easy to understand, Dr. Kennedy addresses head-on the fears and misinformation about the long-term effects of crying and takes a bold stand on controversial issues such as co-sleeping and attachment parenting. With polarizing figures and techniques dominating the marketplace—and spawning misinformation across the internet—Dr. Kennedy’s methods and practices create an extensively researched and parent-tested approach to sleep training that takes both babies’ and parents’ needs into account to deliver good nights and days of sleep, and no small dose of peace of mind. The Good Sleeper is a practical, empowering—and even entertaining—guide to help parents understand infant sleep. This research-based book will teach parents the basics of sleep science, help them determine how and when to intervene, and provide tools to solve even the most seemingly impossible sleep problems. Listen to Dr. Kennedy discuss The Good Sleeper on iHeartRADIO. The Good Sleeper gets a rave review on CityDadsGroups.com. Read it here. Finally! An accurate, well-researched, evidence-based, reassuring, effective and READABLE book about infant sleep! With my first child (sadly before the days of the Good Sleeper book), Janet guided us through the early stormy days of infanthood, the trials of sleep training, and through a stubborn nap issue. Ever since, our friends have commented on what an amazing sleeper our toddler is. It takes us 5 minutes to put him to bed, and he happily (and excitedly) takes naps and goes to bed at night. He actually waves goodbye to us and tells us to shut the door when we leave! He has a great relationship to sleep, and we’re so thankful! We were able to consult the Good Sleeper for our second baby, and all the same great advice was there, easily readable and well-explained. And it’s working just as well with #2! Buy this book for you and for every new parent you know–you’ll be giving them and their kids the gift of hours of sleep.” Maryhope R.
Want to share your comments about The Good Sleeper? "Dr. Kennedy has written a smart, readable book that will have parents feeling empowered about a time when most have felt powerless– at three in the morning, the baby's screaming, and they haven't slept in two days. The Good Sleeper is an instant classic that will be at the bedside table of every parent." "The Good Sleeper gives new parents the thing they most covet—a good night's sleep. Though sleep advice abounds from well-meaning friends and relatives, it is often conflicting or confusing. Dr. Kennedy has a simple, straightforward approach that makes the most daunting sleep problem manageable, and delivers the information concisely so that even the most exhausted parent will be able to benefit from her wisdom." 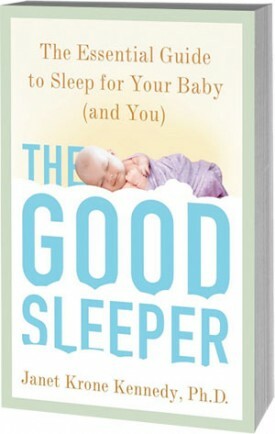 "Backed up by research and common sense, The Good Sleeper is a must-read for all new parents. From the moment you read Kennedy’s book you feel as if you’re in great hands. Her clear, no-nonsense approach gives parents the knowledge and courage to teach their babies this all-essential first task— how to sleep."